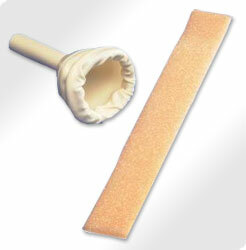 Kendall DOVER Adhesive Straps are used to hold an external catheter in place. straps supplied with catheters were too hard to remove without tearing. I purchased separate ones from Stl and they were more sturdy and light grey. This made them easy to remove. Last purchase was dark grey, hard to see end and hard to remove with out tearing.